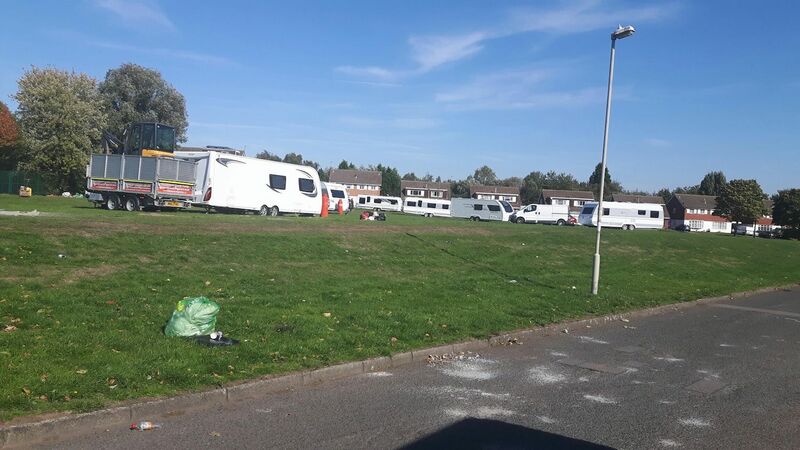 Last week we were instructed by Environmental Health from Dudley Metropolitan Borough Council that a Court Hearing was taking place on that date (Monday 24th September) for the removal of an illegal traveller encampment in Ketley Field in Kingswinford, Dudley, West Midlands and it was the intention to transfer this matter to the High Court for enforcement. A High Court Writ of Possession was obtained and forwarded to us for enforcement at the earliest opportunity. Arrangements were then made for agents from around the country to carry out this enforcement and to gain Vacant Possession of the land on Tuesday 25 September 2018. This was particularly urgent as the travellers were located very close to a school and there were concerns about the amount of fly tipping that was already occurring. In view of the large numbers of caravans, vehicles and persons on this site it was appropriate to carry out a covert visit by two agents to see if there were any particular hazards that could affect the successful operation needs. Our agents visited this address and noted that there were in excess of thirty caravans with associated vehicles. It was also noted at this time that there was significant amounts of rubbish including trees, tarmac, slabbing and what they assumed to be human waste. A constant watch was kept on the land until it was time for the briefing for all agents who were to carry out the eviction. During this time it was noted that at least one of the family gathering had chosen to leave and a number of caravans left the site – possibly before the time that had been given by Police before as to when the eviction was to take place. A complete health and safety and operational briefing was held at a rendezvous close by, during which all eventualities were discussed together with tactics to be used during the operation itself. At this time a recovery truck was put on standby but the intention was to attempt to evict the travellers without the need to utilise this. All of the Authorised High Court Enforcement Agents attended the site at 9am and agents were designated to leave notices with all occupants of the caravans and vehicles giving them one hour to vacate the land. Whilst it is most unlikely that the travellers would vacate by this time it was the starting point for negotiations on an ‘actual agreed time’. At this the travellers became somewhat aggressive and the usual threats were made against the agents, and, of course they were told that they would not be leaving. There was a stand-off for a considerable time until a further negotiation was made for the travellers to vacate the land by 2pm. It was clear to our agents that as the 2pm deadline approached there was little movement apart from one family hitching up the caravans on to their vehicles. A decision was then made to call in the recovery truck in case we needed to remove caravans/cars from the site. During these times the Police were paying passing attention and it was agreed that if the caravans did not move off by the agreed time we would commence the forceful removal with the Police in attendance to prevent a breach of the peace. We were also informed of a possible female being in hospital. Although this is a regular delaying tactic for travellers it was found to be correct on this occasion. As a result our welfare trained officers liaised with Police and the husband of the traveller and an agreed strategy was implemented. Throughout the operation our agents kept the representatives from the Council informed of proceedings –we were particularly mindful of clearing the site before the local schools finished – thereby reducing any possible dangers to passing pedestrians. Additionally, our agents attended the local school and shops in the close vicinity to keep them updated on the progress and our intentions. The local community appeared to value this information at the time. At 2.02pm it was decided to bring the recovery truck on to the site and we immediately put a winch on one of the vehicle trailers that was carrying a small digger. This provoked even more aggression from the travellers and our agents were surrounded – children were also instructed by the adult travellers to climb on to the recovery truck to make it difficult to load without causing injury to either the travellers, their children or indeed our agents. As it had been discussed previously with the Police, consideration was given to perhaps initiate the taking of children in to temporary care as they were clearly being put at risk by their own community in the circumstances. In an attempt to gain a peaceful resolution to this ongoing incident a further negotiation was made and agreed that we would not take away the trailer if the remaining occupants returned to the site and vacated in accordance with the instructions on the Writ of Control. A 20 minute deadline was agreed and shortly afterwards most of the travellers returned and started to pack up. Clearly, the message had got to the travellers that they would be losing their belongings if they did not respond quickly. At this time we also deployed agents to the other sites were designated on the Writ of Possession to prevent any incursions there. Eventually, by 3.15pm, apart from three caravans the site was clear. At this time we stood down a number of our agents and left three agents in situ until the site was totally clear at just after 4pm when the relatives of the hospitalised lady were in a position to move their caravans. We had successfully gained vacant possession at this time and in line with the direction of the Council particularly having regard to the local schools and schoolchildren.